Melvin Thomas Ott (March 2, 1909 – November 21, 1958), nicknamed "Master Melvin", was an American professional baseball player who played in Major League Baseball (MLB) as a right fielder for the New York Giants, from 1926 through 1947. Ott was born in Gretna, the seat of government of Jefferson Parish in suburban New Orleans. He batted left-handed and threw right-handed. He was an All-Star for eleven consecutive seasons[lower-alpha 1], and was the first National League player to surpass 500 career home runs. He was unusually slight in stature for a power hitter, at 5 feet 9 inches (1.75 m), 170 pounds (77 kg). There may be reason to believe that he was a better hitter than his record suggests because of differences in National League and American League ball specifications ("All too forgOtten" Steve Treder, October 2, 2007). Those differences are considered the most outstanding in the history of the game and made it considerably harder for National League hitters to achieve home runs. 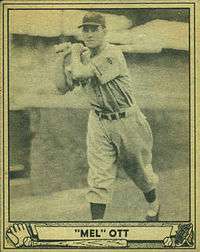 Ott played in the World Series in 1933, 1936 and 1937, winning in 1933. He hit two home runs during the 1933 series. In game 1, he had four hits, including a two-run home run in the first inning. In game 5, he drove in the series-winning run with two outs in the top of the 10th, driving a pitch into the center-field bleachers. In the 1936 World Series, Ott had 7 hits and 1 home run. In 1937, he had 4 hits and 1 home run. In 1951, Ott succeeded Chuck Dressen as manager of the Oakland Oaks of the Pacific Coast League, leading the club to an 80–88 finish (seventh place). In 1952, the Oaks finished 104-76 under Ott, good for second place in the PCL. Ott was involved in an auto accident in Bay Saint Louis, Mississippi in 1958. He was transferred to a hospital in New Orleans, where he died one week later. He was interred in Metairie Cemetery. Ott died in a similar manner to two other New York Giants Hall of Famers: Frankie Frisch in 1973 and Carl Hubbell in 1988 (the latter 30 years to the day after Ott's death). Ott is remembered in his hometown of Gretna, where a park is named in his honor. Since 1959, the National League has honored the league's annual home run champion with the Mel Ott Award. In the 1989 film Field of Dreams, Ott was one of several deceased players portrayed in farmer Ray Kinsella's Iowa cornfield. In 2006, Ott was featured on a United States postage stamp, as one of a block of four honoring "Baseball Sluggers" — the others being Mickey Mantle, Hank Greenberg, and Roy Campanella. In announcing the stamps, the U.S. Postal Service stated, "Remembered as powerful hitters who wowed fans with awesome and often record-breaking home runs, these four men were also versatile players who helped to lead their teams to victory and set impressive standards for subsequent generations". Ott is also remembered in the name of the Little League of Amherst, New York. 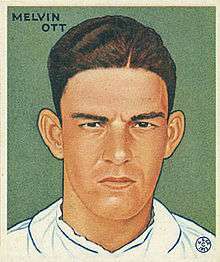 The Mel Ott Little League began in 1959, named for the recently deceased superstar. ↑ Hardy Jr., James D. (2007). Baseball and the Mythic Moment: How We Remember the National Game. Jefferson, North Carolina: McFarland & Company. pp. 32–34. ISBN 9780786426508. Retrieved March 18, 2015. ↑ Pellowski, Michael J (2007). The Little Giant Book of Baseball Facts. United States: Sterling Publishing Co. p. 352. ISBN 9781402742736. ↑ "Baseball Quick Quiz". Baseball Digest. 31 (12): 77. December 1972. Retrieved December 16, 2011. ↑ "Baseball Sluggers". The 2006 Commemorative Stamp Program. USPS. 2005-11-30. Retrieved 2008-01-23.